Most of us have heard the phrase “Bitcoin“, as it appeared in numerous news articles and tech blogs. I’m also pretty sure that most of us know that “Bitcoins” is seen as some sorts of “online currency”. Trying to figure out how it all works on the other hand is a totally different story, as I’ve found out myself when I was trying to get started. Most articles out there are very technical, and often very confusing. In this article I’ll try to compare bitcoins (or BTC) with regular currency, hopefully helping you to understand the phenomena better. Bitcoin introduction: What are bitcoins? Bitcoins (often abbreviated as BTC or XBT) can be seen as a currency, a.k.a. money, that can be used for buying goods or services or savings, and can be earned by selling goods or by delivering work. Like money in you bank account, bitcoins do have a real value, it is however virtual money. There are no coins or bills. Compared to real world money (by lack of better words), it can be seen as the money in your checking account, which you can transfer to another back account to purchase products or you can keep it in you bank account for saving. You “fill” your bank account the same way as with a bitcoin wallet: Receive payments for delivered goods or work. The name “Bitcoin”, with a capitable “B” refers to the Bitcoin Network. The phrase “bitcoin” refers to the tokens representing value. Commonly the abbreviation BTC is being used as well, like USD for US Dollars. The BTC code however is believed to change to XBT. Bitcoins can be divided in smaller sub-units, like a dollar can be divided in cents (1 dollar = 100 cents). 1 bitcoin = 1,000 mBTC, or in other words: a mBTC is a one thousands (1/1,000) of a BTC. 1 bitcoin = 1,000,000 μBTC or a μBTC is a one millionth (1/1,000,000) of a BTC. A Satoshis is the smallest bitcoin unit. 1 bitcoin = 100,000,000 Satoshi or a one hundred millionth of a bitcoin. To be able to sent or receive bitcoins, one needs a so called Bitcoin Address – we’ll go into the details later on. There are no physical coins or bills for Bitcoins. There has been a lot of commotion about Bitcoin, and it’s most certainly worthwhile to read the Bitcoin FAQ. Bitcoins can be used for criminal activities, but in reality this is not any different than cash money, and bitcoins are most certainly not designed with criminal activities in mind. The value of bitcoins value is volatility, with the value of a single bitcoin bouncing all over the place. Again, not much different than real world money, just a lot faster and truly based on supply and demand. Which means that the value of a bitcoin can sky-rocket, or drop like a brick. Because of this, please consider (for now) that trading/speculating with bitcoins is kind-a like gambling with stock, so please be careful when investing in bitcoins. And then there is, at this time, the lack of acceptance – most people still do not use bitcoins, mostly because starting with bitcoins can be quite overwhelming. You’ll be surprised though how many stores already accept bitcoins, specially online stores (at this time 2,000+ businesses accept Bitcoins). Bitcoins should not be seen as a “get rich quick” scheme. As with everything: if it sounds too good to be true, it probably is. The value of Bitcoins is very volatile, which means that the value of your Bitcoins can make you a millionaire one day, and bankrupt the other. It is however true that some of the early adopters have made a nice bundle with BitCoins due to it’s changing value. With most real world currencies, there is a so called “Central Bank” at the core of it’s value. This Central Bank regulates how much currency is available (print and destroy bills and coins), tries to regulate it’s value and therefor control it’s stability, and plays a role for overseeing financial transactions to protect the currency. Bitcoin does not have such a Central Bank, and the entire “management” of Bitcoin is based on a peer-to-peer mechanism. In other words: in Bitcoin land, all bitcoin owners, all together, control all of these currency aspects, which makes it decentralized. Of course the value of a bitcoin is important, and several online tools allow you to convert a bitcoin into a real world coin, for example bitcoin to US Dollar or Euro. Over time the value of a bitcoin has made some (economically) interesting moves, starting in the lower $10 USD range, and already having seen peaks of more than $1200 USD per Bitcoin – all influenced by supply and demand. One could argue that early adopters made some very good money out of this, but you have to keep in mind that these early adopters did not only put a lot of effort and risk into this, they also used bitcoins as a currency. So in the end it’s a distorted picture to believe they made easy money. Mostly since they used bitcoins actively, as a pay-off for the risks they took and the work they have done to get Bitcoin, the network, started. There a several websites that can help you with determining the value of your bitcoins, BitcoinExchangeRate.com offers an easy calculator. Please keep in mind that the price or value of a bitcoin depends on the location (market) where you’d like to exchange the currency. For example, an overview of several markets can be found here: BitcoinCharts Markets Overview (Specific currencies: US Dollar markets, Euro Markets). Bitcoins are subject to Exchange rates! As with foreign currency, bitcoins are subject to exchange rates. This implies that the value a bitcoin represents at this moment might be different 10 minutes from now. A completed Bitcoin transaction CANNOT BE REVERSED! Just like with cash money, one the money has exchanged hands, the transaction is irreversible. So make sure to not type the wrong amount or send it to the wrong person, and make sure you can trust the receiving party to deliver. There is no “undo” option, as seen with bank or credit card transaction. Bitcoin transactions takes place between wallets, a nice analogy to the use of cash money – if I pay you $5 then the $5 bill moves from my wallet to yours. This is exactly what happens with bitcoins. A Bitcoin wallet is a typically free application for you desktop or laptop computer, but can also be found as a app for your smartphone or tablet. Just any wallet is of course not enough, as it’s not just any wallet, it needs to be YOUR wallet. Therefor a wallet will need at least one Bitcoin Address to identify you. You can however add more than just one Bitcoin Address to a wallet. The use of multiple Bitcoin Addresses appears common practice to ensure privacy or to help organize your transactions. We need a Bitcoin Address! A Bitcoin Address is free and unique, and Bitcoin wallets I have seen so far automatically generate one unique Bitcoin Address for you to get started. Bitcoin addresses have a weird and hard to remember format, for example: 1HtySjr1tJ64VxoG1yW6skP5fmyNNKancr. Remembering this code is a task for your wallet. But memorizing this code or even typing or writing it down can be a PITA and most wallets come with a copy-to-clipboard function. To make things easier, specially with mobile users, so called QR Codes are being used. Certain applications and websites provide the means to generate such a code, for example BitcoinQRcode.org. The Bitcoin logo in the QR code below is optional. To get started, I’d pick one of the easier to use wallets like MultiBit or Electrum. Both of these wallets are free, fast and easy to use. More advanced wallets, like the full-size Bitcoin-QT, are good for advanced users, and download a lot of data to get started. Nice for when you’re more familiar with Bitcoins, but it takes a long time to get started and using it may be a tad too much for your first wallet. Online Bitcoin wallets or Web wallets store your bitcoins on their network. This means they have you “money”. Each of the wallets I have tested generate one Bitcoin Address automatically, and have the option to create multiple Bitcoin Addresses. Each of these addresses can often be given a description, making it easy to group spendings and income. I’d start with just one Bitcoin Address of course, until you have a better understanding of the Bitcoin business. To receive Bitcoins, you’d need a party that wants to give you Bitcoins. This can be through a donation, a sale, or just as a birthday gift. Just like with regular money. Sending bitcoins works exactly the same way, just like in real life. For you to receive Bitcoins, the other party will need tour Bitcoin Address. If someone wants to pay you, they simply open their Bitcoin Wallet and enter your Bitcoin Address, the amount of bitcoins, and optionally a note for reference. When you look at you wallet, then this will all make sense. Keep in mind though that your bitcoins “live” in your wallet and cannot be found in ANY other location. So if you loose your wallet, your bitcoins will be gone … permanently! Here is where things might get a little tricky – as said before: bitcoins live in your wallet. But what if you’d like to change wallet? Say for example from a desktop wallet to a smartphone wallet, or from one desktop wallet to another? There appear to be tricks involving copying the wallet.dat file, but it can happen that the format of this file is not exchangeable with your new wallet. When going from desktop to mobile wallet things get even more difficult. The only good way to transfer wallet content to another wallet is by sending it as a payment to the Bitcoin Address of your new wallet. Another way is by exporting private keys (wallet.dat), but again: not all files are interchangeable between the different apps! Transaction fees may be applied when transferring bitcoins, unlike banks however this is not based on the amount of bitcoins you transfer – so the fee for transferring a million bitcoins could be equally low as sending a single bitcoin. The fee however, if applied at all, depends on the amount of data that needs to be processed and is not based on the amount of bitcoins. – number of inputs and outputs needed (see below). Most Bitcoin Wallets pre-calculate fees, in case they apply, and warn you before completing the transaction! This all results in a pretty complicated calculation – well, the source of information (age) is definitely the tricky one. – transactions that require more than 1000 bytes data. Say you received 3 transactions so far. One for 1 BTC, one for 1.5 BTC and one for 0.5 BTC. So you have 3 BTC in your wallet. Like with real money in your real physical wallet, coins do not magically merge to one single coin. The same goes for bitcoins: These bitcoins do not merge to one single 3 BTC “coin” and remain 3 “coins” of 1, 1.5 and 0.5 BTC. When you pay for something with bitcoins, your wallet will have to combine these “coins” to make a fitting payment – exactly the same as what you’d do with regular money in your regular wallet. Input: Say we’d like to pay someone 3 BTC then your wallet takes these 3 coins as inputs. Input is the number of “coins” we use to pay. Output: The total amount of bitcoins payments. If you get change back however, then these will be counted as outputs as well! Output therefor is the number of payments that change hands. 1) Pay one person 3 BTC based on the 1, 1.5 and 0.5 BTC “coins”. Input = 3, Output = 1, and size = 488 bytes. 2) Pay two people, each 1.5 BTC, based on the 1, 1.5 and 0.5 BTC “coins”. Input = 3, Output = 2, and size = 522 bytes. 3) Pay one person 2.75 BTC based on the 1, 1.5 and 0.5 BTC “coins” and 0.25 BTC change. Input = 3, Output = 2 (payment and change), and size = 522 bytes. If this size exceeds 1,000 then a transaction fee is “required”, so the above transaction examples are free. Keep in mind though that the payments are very minimal, except Bitcoinget where you may be able to get a reasonable amount paid for certain tasks. Bitcoins can also be earned with what they call “Mining”. Working as a Bitcoin Miner is an interesting way to “make money”. Mining is the process where your computer (for example) is working for you in solving complex mathematical problems. These “problems” are related to processing past and current Bitcoin transactions (see also: BitcoinMining.com), making te Bitcoin network more secure. These mathematical problems are arranged in blocks, which confirm to the network that transactions are real, and that nobody is trying to “re-use” their Bitcoins after they already had spend it. For each “block” found in these mathematical problems, Bitcoins are awarded. The award for finding blocks however will reduce over time and that’s why additionally money can be made by processing current transactions. The problem with working as a miner however is that as an individual, unless you invest in special hardware, is becoming more and more difficult. Mathematical challenges will become more and more difficult since available hardware becomes more and more sophisticated in solving these particular Bitcoin calculations. This naturally makes sense otherwise earning Bitcoins through mining would become easier and easier over time. The first applications ran on a regular computer (CPU Mining), eventually video cards (GPU Mining) were used as they did the math much faster, then very fast dedicated devices (FPGA Mining) and fast, yet power efficient, devices (ASIC Mining) were introduced. The FPGA and ASIC devices perform extremely well, but come at a pretty steep price. Some commonly used mining applications (a great video card helps!) can be found on the Bitcoin Wiki Page (Mining Apps). Inform yourself before beginning with investing in mining hardware, specially “older” hardware offered at eBay and the likes. It will take a lot of effort to “earn” back your investment, so read up and make sure you know what you’re doing before investing a lot of money into special hardware. 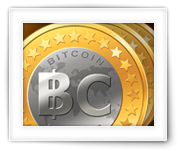 As with foreign currency, bitcoins can be purchased at an exchange. Back in the day, in Europe anyway, Exchange offices could be found at your local bank or at the numerous border locations. Bitcoin however is an online thing, so the exchanges can be found online as well – it’s worth the effort to shop around and see where you can find the best rates. A pretty good list of Exchange locations can be found on HowToBuyBitcoins.info. Each of these Exchanges seems to specialize on a particular angle. When buying or selling bitcoins, money is being transferred to or from established bank accounts, credit cards, online payment services like PayPal, etc.